On the north side of the B879, about a quarter of a mile east of the junction with the main road running up the east side of Kintyre, the B842, is the Carradale Network Centre, a heritage centre devoted to the story of Carradale and this part of the Kintyre peninsula. 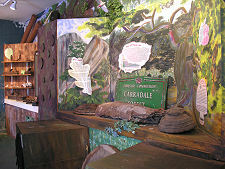 Its location places it about a mile short of the main focus of the village of Carradale. Housed in what was once a school, the Network Centre has two main elements. 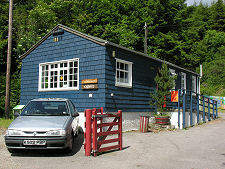 On the left, as you look at it from the road, is the tearoom. On the right is the heritage centre itself. You are unlikely to drive past the Network Centre without noticing it. 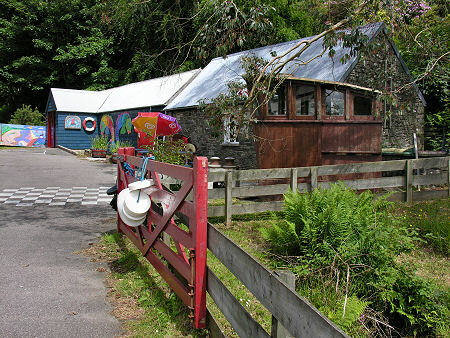 As well as being nearly opposite the signed turnoff for the caravan site and for Carradale House, the blue-painted buildings are strikingly decorated with technicolour fishes and lifebuoys. 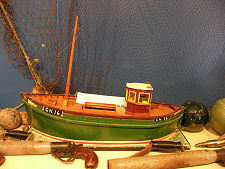 These give a hint of one of the themes explored inside the centre, as does the wooden fishing boat wheelhouse you find placed just inside the centre's main gate. 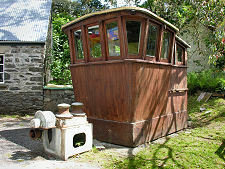 The centre itself may be over a mile inland, but it fully recognises the great importance of the sea to the story of Carradale, both in terms of the development of the fishing industry, and in the way steamer traffic helped the village grow in the decades either side of 1900 by bringing a steady stream of trippers here. 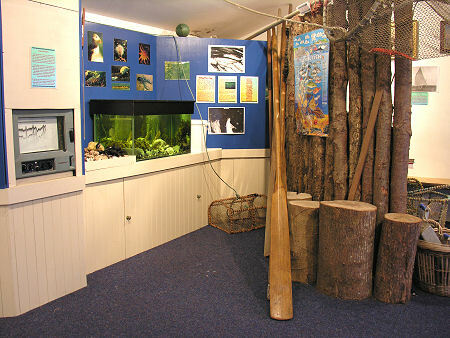 Inside the centre the theme is carried through with fishing boat models, with nets, and with a display of the radio and depth-sounding equipment that has transformed fishing in recent decades. Another important theme covers an industry that has had a great impact on Carradale and the surrounding area in the years since 1950: forestry. Over the past half century the whole of the eastern half of mid Kintyre has seen extensive tree planting, and today trees, and everything to do with them, are an important source of employment on the peninsula. They also have a dramatic impact on the way the countryside looks and feels. 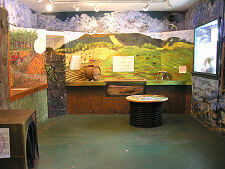 Elsewhere in the centre, some of the area's other traditional industries are also covered. 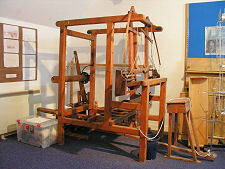 In one room you find a hand-loom, while another looks at the history and practice of farming in Kintyre.